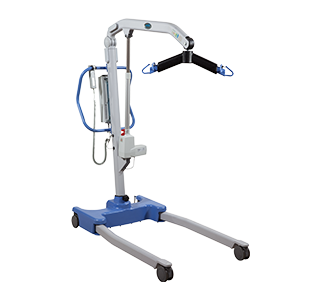 The Hoyer® Presence® lift has been engineered and designed to handle almost any resident-handling task. Included is Smart Monitor technology that displays lifting activity as well as reminds you to recommended service. This helps drive user compliance and keeps your Presence in top shape! Along with the Stature lift, the Presence can lift residents from the floor as well accommodate transfers to higher surfaces. The 500 lb. Safe Working Load and greater spatial area make this lift a perfect fit for larger residents. The Presence comes standard with a powered base and is available with a scale option.